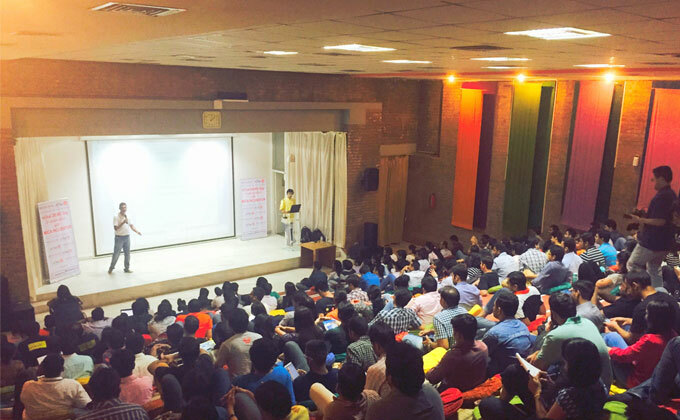 MICA Incubator, in association with eChai, an online-offline collaborative network of entrepreneurs, organized an event famously known as the “Demo Day”, wherein various founders of early-stage business start-ups, presented ideas and discussed future plans, revenue models and ways in which their businesses ease the life of a day-to-day consumer. A majority of the entrepreneurs were from the student community. The program was hosted by Mr.JatinChaudhary, the founder of eChai, who has successfully organized various Programs which bring together professionals, mentors and youngsters in over 25 cities to discuss and share business models. “All these programs do 3 things well - they provide an opportunity to young entrepreneurs to showcase what are they upto, platform for experienced/successful entrepreneurs share their experiences and insights and it gives a feel of being part of the community”, he said. Also associated with the “Demo Day” Platform were two other organizations – “Innovify”, an start-up incubator and accelerator that provides a healthy ecosystem for nurturing entrepreneurs and “Entrepreneurial Spark”, a UK based company that aims at bringing about social change through development of entrepreneurial mindset and behaviour. Prof. U.T. Rao, Chair, MICA Incubator and Faculty in the General Management Area was invited on-stage to deliver the welcome address, after which the floor was left open for presenters who have run successful ventures in various business segments. 1. MYBYK - a bike share programme aimed at encouraging the use of bikes by enhancing the ownership experience and making it hassle free and more convenient. It is also a bike that you can ‘Drop Anywhere & Pick from Anywhere’. Mr. ArjitSoni, the founder, is currently working on developing “Smart Bicycles” which have a GPS system so that logistically, the system runs more efficiently. 4. TheIndia.co.in - India's first of its kind tourism community portal helps tourist to find best places to visit in India. You can explore places & travelogues about Indian tourist destination and can share your own stories with fellow travelers. 6. HashChat.me creates a virtual Chatroom out of tweets, hashtags and people talking about an Event or Conference. Quickly introduce yourself to people you meet during Events and get back to them later with HashChat's "QuickIntro". HashChat is also a fully featured twitter app with a design and user interface that touches simplicity with beauty. 8. tradohub.com - an exclusive e-commerce portal of Industrial Raw Materials for Small & Medium Enterprises (SMEs). 10. Foodsome (Food + awesome) is online restaurant portal in your city for the crazy food lovers. Right now FoodSome is only in Surat. 11. OneWayCabs.co.in – an intercity one-way radio cab service that allows users to travel from the airport in two prime hubs of Gujarat (Ahmedabad and Vadodara) to various other towns in the state at reasonable rates. “It isn’t an interest specific platform, and after the beta stage we will be implementing a lot of cool new features like the instant private messenger. It is already available on the Google Play Store and will soon be launched in an iOS platform,” said Mr. Ram Punjani, one of the founders of Converza and an alumnus of SIBM Bengaluru when asked about his new business venture. While speakers like, Mr. Punjani, have already received funding from institutional investors, others like Mr. AkashDomadiya, founder of tradeohub.com, has already seen his business making a turnover of 3 crores in 3 months. Post the presentations were the award ceremony. The list of awardees is mentioned below. • Ankur Gupta, Co-Founder, Brewberrys - a leading chain of coffee bars offering cafe franchise across India. • Darshan Dasani, Founder, Tea Post - fastest growing Tea cafe of Gujarat. • Veena Parikh, MD, Shashwat Systems - the leading manufacturer, supplier and exporter of Hydraulic Cylinders and Power Pack solutions. • Abhishek Desai, Co-Founder, Digicorp - helps entrepreneurs and companies build large-scale software products. Focused on design and speed, our solutions outsmart the competition. He is an avid blogger and loves WordPress and open source. He runs a blog for Govpreneurs (those who innovate for social change within or along with Government). He evangelizes Government 2.0 and change through collaboration.